The idea of publishing the work here presented did not suggest itself until a large portion of the material it contains had been accumulated for the private use and personal gratification of the author. In pursuing the study of the Bible Myths, facts pertaining thereto, in a condensed form, seemed to be greatly needed, and nowhere to be found. 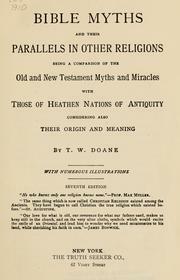 Widely scattered through hundreds of ancient and modern volumes, most of the contents of this book may indeed be found; but any previous attempt to trace exclusively the myths and legends of the Old and New Testament to their origin, published as a separate work, is not known to the writer of this. Many able writers have shown our so-called Sacred Scriptures to be unhistorical, and have pronounced them largely legendary, but have there left the matter, evidently aware of the great extent of the subject lying beyond. As Thomas Scott remarks, in his English Life of Jesus: “How these narratives (i. e., the New Testament narratives), unhistorical as they have been shown to be, came into existence, it is not our business to explain; and once again, at the end of the task, as at the beginning and throughout, we must emphatically disclaim the obligation.” To pursue the subject from the point at which it is abandoned by this and many other distinguished writers, has been the labor of the author of this volume for a number of years. The result of this labor is herewith submitted to the reader, but not without a painful consciousness of its many imperfections. The work naturally begins with the Eden myth, and is followed by a consideration of the principal Old Testament legends, showing their universality, origin and meaning. Next will be found the account of the birth of Christ Jesus, with his history until the close of his life upon earth, showing, in connection therewith, the universality of the myth of the Virgin-born, Crucified and Resurrected Saviour. Before showing the origin and meaning of the myth, we have considered the Miracles of Christ Jesus, the Eucharist, Baptism, the Worship of the Virgin, Christian Symbols, the Birthday of Christ Jesus, the Doctrine of the Trinity, Why Christianity Prospered, and the Antiquity of Pagan Religions, besides making a comparison of the legendary histories of Crishna and Jesus, and Buddha and Jesus. The concluding chapter relates to the question, What do we really know about Jesus? But little beyond the arrangement of this work is claimed as original. Ideas, phrases, and even whole paragraphs have been taken from the writings of others, and in most, if not in all cases, acknowledged; but with the thought in mind of the many hours of research this book may save the student in this particular line of study; with the consciousness of having done for others that which I would have been thankful to have found done for myself; and more than all, with the hope that it may in some way help to hasten the day when the mist of superstition shall be dispelled by the light of reason; with all its defects, it is most cheerfully committed to its fate by the author. THE JESUS PUZZLE :Was There No Historical Jesus? « Space — a huge Mystery!